At least three years of traffic changes begin this fall as work starts on a pair of major construction projects: a new security checkpoint area above the existing traffic lanes and a new regional jet concourse to replace Gate 35X on the north end of Terminal B/C. WASHINGTON — People flying in and out of Reagan National Airport, and the people picking them up or dropping them off, are being warned of major traffic headaches beginning in the next few months. After a presentation to the Metropolitan Washington Airports Authority Board last week, Executive Vice President and Chief Operating Officer Margaret McKeough and Vice President and Airport Manager Paul Malandrino warned that the already congested roadways at the airport will become even more clogged during construction. “Departing passengers will continue using the existing roadways, walkways, ticket counters and security checkpoints with few exceptions. Arriving passengers will use the same pathways they use today, but roadway and curbside changes outside the baggage claim level of Terminal B/C will be noteworthy,” McKeough said in a statement. Initially, workers will cut through the concrete median that divides the cab pickup area closest to the terminal from the general traffic lanes closer to the Metro tracks. The two new sections of pavement connecting the two sides will allow later traffic shifts from one side to the other on that baggage claim level as the new security checkpoint is built in phases above the roadway. 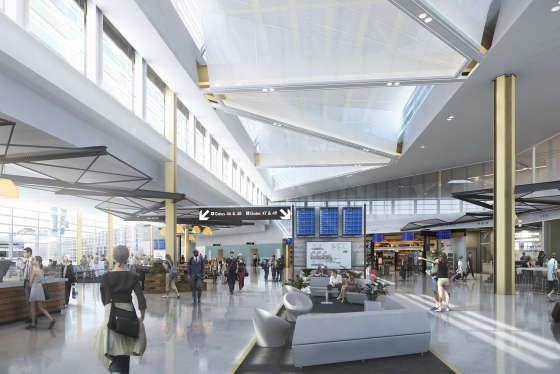 A $1 billion overhaul of key parts of Reagan National Airport will include new checkpoints and a terminal that will mean travelers no longer have to squeeze onto buses to reach small planes. But the construction comes with some traffic changes. See photos of what’s in store. 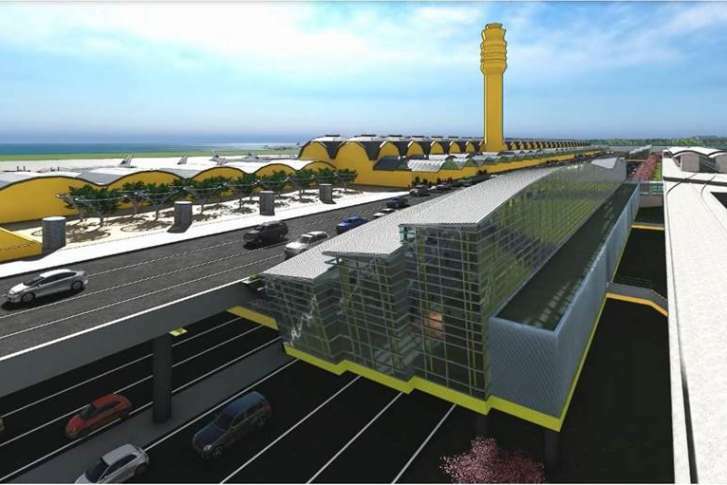 “The project’s most significant impacts will be felt when lane closures in front of Terminal B/C combine with peak traffic periods on the airport roadway system, which is already busy due to record use of Reagan National,” the airports authority said. Extra police officers and other airport staff are scheduled to help direct traffic with assistance from command-center style headquarters. At the same time, separate work on the new 14-gate commuter concourse that will end the shuttle buses to small planes from Gate 35X begins in earnest this fall with the demolition of buildings that are in the way. First, the old airports authority headquarters building will be torn down, followed by two 1950s-era hangars. Real construction on the new terminal is scheduled to begin in 2018 so that the concourse can open in 2021. By the time the new security checkpoint and commuter concourse open, it could be easier to access the airport as well. The Crystal City Business Improvement District is now looking into building a simpler way to walk between the airport and Crystal City. Today, what should be a walk or bike trip of just a few hundred yards instead involves a long, winding walk of just over a mile. Any connection could be built into the new Crystal City VRE station that is in the final planning stages. That station is part of broader additions to the tracks in that area that could increase rail service while also moving the station closer to the heart of Crystal City. Virginia Railway Express CEO Doug Allen has also suggested the connection could work. The study would move quickly, with a contract awarded in early August, public information meetings in September and final conclusions on the possible bridge or tunnel options to the airport by mid-October. Key parts of internal airport design plans are also due to be finished in October. The planning study would include estimated costs for each potential design, ways to pay for construction and maintenance, and how long any project would take to build. The study will also consider the challenges of building a connection across property owned or controlled by Metro, CSX railroad and the National Park Service, and how the additional option could cut down on traffic at the airport or impact the use of the Crystal City Metro station. Arlington County, Metro, VRE, Virginia’s Department of Rail and Public Transportation and a number of developers and major Crystal City property owners are considered key stakeholders in the effort. August: Contract awarded to study new Crystal City-Reagan National Airport connection. Coming months: Reagan National traffic patterns begin to change; an office building on the site of the new commuter jet terminal starts to be torn down, followed by 1950s-era hangars. October: Final results of Crystal City connection study. 2018: Long-term construction traffic patterns set up at Reagan National as work on new security checkpoints picks up; construction of the new 14-gate concourse to replace Gate 35X also due to begin. By early 2018: General design of new Crystal City VRE Station agreed on, costs and schedule determined; preliminary engineering begins. 2020: Security to be moved up to new area above roadways; main hall at the airport only open to ticketed passengers. 2021: Gate 35X busing ends; new commuter jet concourse opens providing jetways to each plane. TBD (VRE hopes for around 2022): Construction of new VRE station and potential Crystal City BID connection between VRE station and airport.